Edinburgh 360° ~ Shops In Edinburgh. Shopping In Edinburgh. Tweed specialist tailors of fine Ladies and Gentlemen's clothing. The first Scottish store opened in 2002. A 5 storey store located on St. Andrew Square, with far reaching views over the city of Edinburgh and the Firth of Forth. Including a Foodmarket, Beauty, Womenswear, Forth Floor Restaurant & Women's Accessories. Selling Whiskies from all over Scotland, and many gift ideas. Royal Mile Whiskies is located opposite St. Giles Cathedral, on Edinburgh’s famous Royal Mile. Hawkin's Bazaar offer a unique and extensive range, with hundreds of toys, games, gadgets, curiosities and puzzles for children and adults! The definition of luxury shopping in Edinburgh. 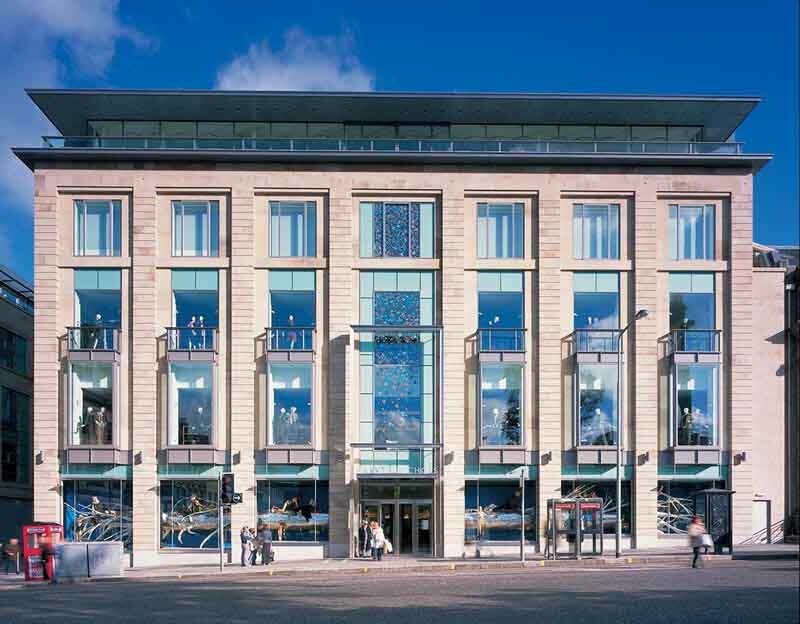 Home of Scotland’s only Harvey Nichols, Louis Vuitton, Marina Rinaldi, Anne Fontaine and many other exclusive fashion brands mean the Multrees Walk shopping experience is second to none. With countless designer labels on offer, a trip to Harvey Nichols is a must for any visit to the city centre. You’ll find the likes of Bottega Venetta, Jill Sander, Balenciaga, Gucci, Prada, Marc Jacobs, Chloe and a profusion of other luxury fashion brands. Multrees Walk is also home to directional young fashion brands like Reiss, G-Star, Firetrap and Replay as well as established luxury labels like Armani and Mulberry catering for even the most demanding fashionistas. For gifts and accessories - choose jewellery choose from Links of London, Azendi and Pandora. But if arm candy isn't what you’re after you can always check out The Pen Shop, Oscar and Fitch or Bravissimo. If you’re addicted to shoes you'll find plenty here too - Louboutin, Choos and Manolos in Daniel Footwear; along with plenty of lust-have styles in Kurt Geiger and for those with more casual tastes in footwear Sole is the choice for you. St Andrew's Square, Mulltrees Walk, Edinburgh. Leading the avant-garde of fashion without compromising traditional craftsmanship of luxury leather goods, ready-to-wear, shoes, watches and Jewellery. Occupying four floors of a historic listed building dating back to the 1700’s, this store is directly facing St. Giles Cathedral on the historic Royal Mile and a stones throw away form Edinburgh Castle. Situated on Edinburgh’s fashionable George St, in a building designed in 1867 for the Crown Insurance Company, this shop enjoys an enviable location with neighbours such as Karen Millen, The White Co., and Hamilton and Inches Jewellers. Debenhams Department Store. The popular retailer for clothing, electrical, and furniture. Edinburgh Antiques. Located in the Lawnmarket area of Edinburgh. Heritage of Scotland is located just outside Edinburgh Castle on Lawnmarket. Selling wool kilts as well as thousands of scottish souvenirs. Hamilton & Inches is recognised as one of the UK's leading purveyors of jewellery, watches, silver and luxury goods. The Edinburgh flagship store is on George Street. A family run Scottish design & architecture firm, founded in the early 1980's by Annie & Lachlan Stewart. All Anta products are made in Scotland, from the finest natural materials, with colours inspired by the Scottish landscape. Kitchen Equipment Specialist Nisbets Opens Its Second Scottish Store. Local foodies, amateur chefs and enthusiastic bakers in Scotland are now able to get their hands on all the latest kitchen gadgets and utensils, with the opening of a new professional equipment store in Edinburgh! Nisbets celebrated the opening of its second Scottish store, situated in Edinburgh’s West Port, with a launch event on Friday 8 July - ahead of the famous Edinburgh Festival Fringe in August, when the city will see an influx of visitors! As the go-to supplier for professional chefs throughout the UK, Nisbets launched as a catalogue business back in 1983. Since then the company has grown at an astonishing rate, with customers now able to choose from over 20,000 products online. They can benefit from Next Day Delivery, and their Click & Collect service, and get products delivered direct to their local Nisbets store. At the new premises, Edinburgh shoppers can choose from 3,000 best-selling products at the new branch. Customers have an opportunity to try products before buying, view product demonstrations and get advice from the knowledgeable team about which products are best for their business. Allowing local “gastronauts” to kit out their kitchens with the latest equipment from top brands such as Waring, KitchenAid and Samsung, Nisbets is the one stop kitchen shop in Scotland for inspired amateur chefs and food lovers.